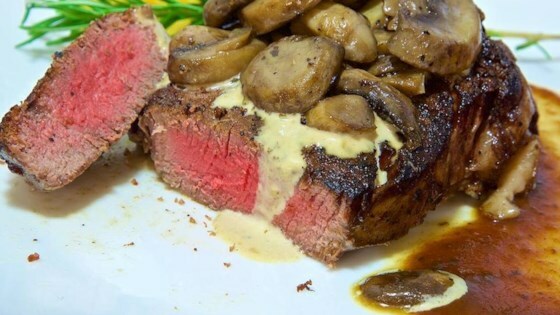 "These luscious steaks' peppery bite is tamed with a velvety cream sauce." Place the peppercorns into a shallow bowl. Sprinkle the beef tenderloin filets with salt on both sides, and coat both sides with crushed peppercorns. Melt the butter with the olive oil over high heat in a heavy skillet (not nonstick) until the foam disappears from the butter. Gently place the steaks in the pan, and cook until they start to become firm and are reddish-pink and juicy in the center, about 3 1/2 minutes per side. An instant-read thermometer inserted into the center should read 130 degrees F (54 degrees C). Remove the steaks to platter, and cover tightly with foil. Pour the beef broth into the skillet, and use a whisk to stir the broth and scrape up any dissolved brown flavor bits from the skillet. Whisk in the cream, and simmer the sauce until it's reduced and thickened, 6 to 7 minutes. Place the steaks back in the skillet, turn to coat with sauce, and serve with the remaining sauce. To save money, purchase a whole tenderloin and slice the steaks yourself. I am pretty much only rating the sauce. I found the pepper cream sauce to be a bit thin. I will make this again but with adjustments to provide a thicker sauce.